PolyBricks are lightweight, maximize structural strength, and allow for the construction of complex and curved buildings. They feature tapered dovetail joints, and a highly intelligent aggregative system that ensures the proper taper angle so that gravity can lock the bricks in place. The research team asserts that this technology eliminates all construction waste, as does the porous structural lattice design, which uses less raw material than traditional solid bricks. 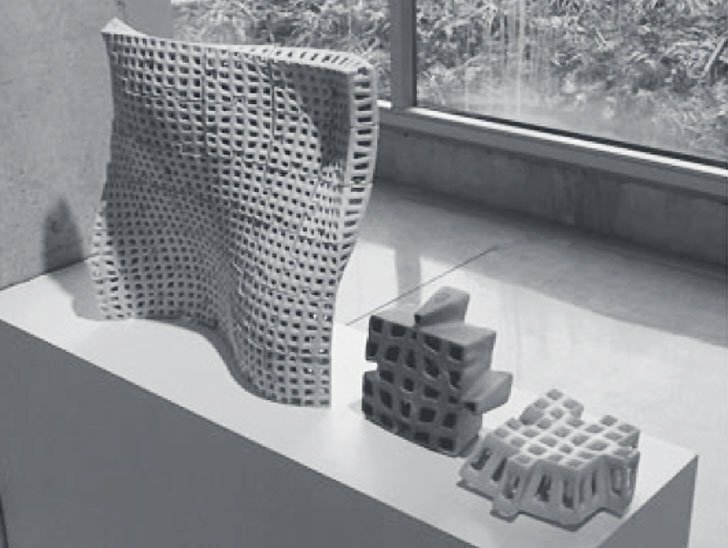 According to Jenny Sabin, the research focused on “the prospect of building part-to-whole assemblies featuring non-standard components and biologically inspired forms.” It also looked at the plastic nature of ceramic as a building material and 3D printing’s ability to design like nature, where every part is different, but the end result is coherent.